It just occurs to me that there are probably no executives left at Paramount who saw B westerns or serials in a theatre, which means none of them are likely to know or care less about Republic Pictures, whose library Paramount owns and, but for recent dealing with Epix/Netflix, steadfastly ignores. Now by dent of having made inventory available for online streaming, home viewers are in happy receipt of seemingly everything Republic did over its twenty plus years life (excepting serials ... are these an awkward format for Netflix?). I used to catch Rocky Lane and Sunset Carson on Encore westerns back when that feed hosted B's --- now I've got whole oeuvres at a remote's command, along with Republic exploration into genres we hadn't associated them with, today's The Lady and The Monster being odd example. This one came smack in middle of world warring, boom years for horror as for every other moving image. Based on quality Republic managed with LATM, I'd have picked them Most Likely Monster-Makers To Succeed had the company plunged deeper into fanta-subjects instead of comparative one-offing of this and a handful of chillers licking gravy off wartime plates. 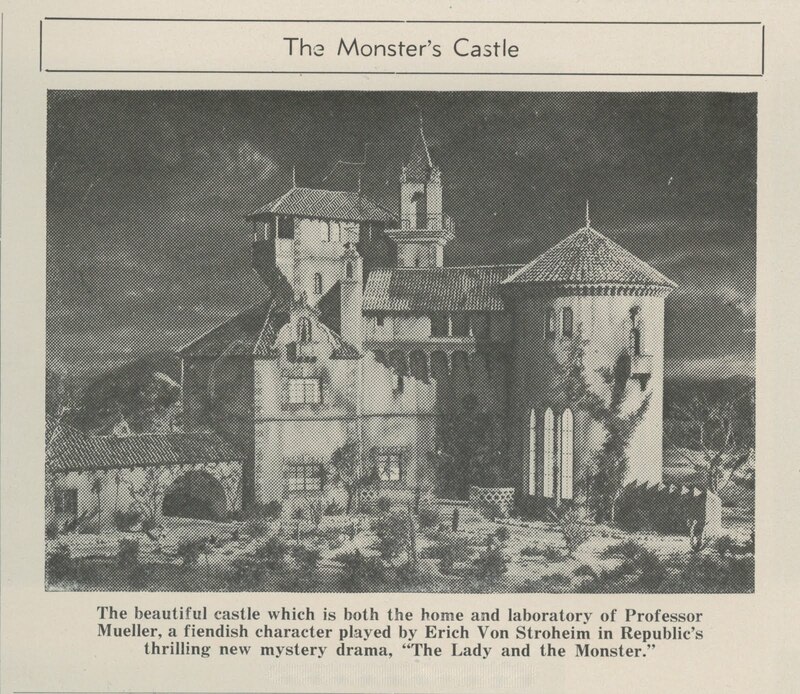 There were reasons Republic spent lavish (for them) on The Lady and The Monster. First was having passed that corner into prosperity enabled by theatres on 24-hour schedule and a public using movies as sedative to grim headlines and loved ones gone from home. Second was the up-from-Poverty Row's attempt to reboot as a major concern among dream merchants, Republic asserting itself now as a player worthy of entrance to better houses and in company of a star aborning, one Vera Hruba Ralston, late of ice skating fame and apple of studio chief Herbert Yates' gimlet eye (that's her with Von below). 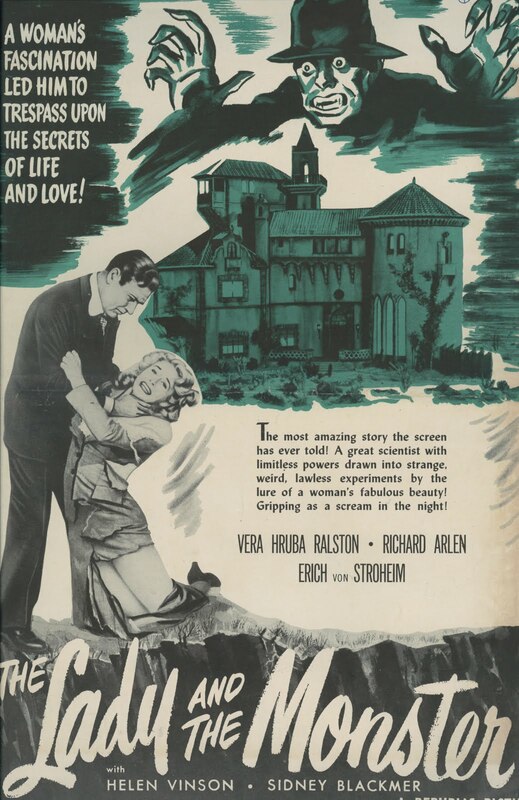 The Lady and The Monster was tabbed primarily to introduce Vera and incidentally as sop for shock fans. Would Yates otherwise pour such resource into what normally amounted to a throwaway B? The property was better than what horrors generally got --- a novel by Curt Siodmak anyone could see as basis for thinking suspense, and if that isn't quite what Republic achieved with The Lady and The Monster, well, at least it was a game try and still improvement on workaday goose-bumping from concerns like Universal and Columbia. 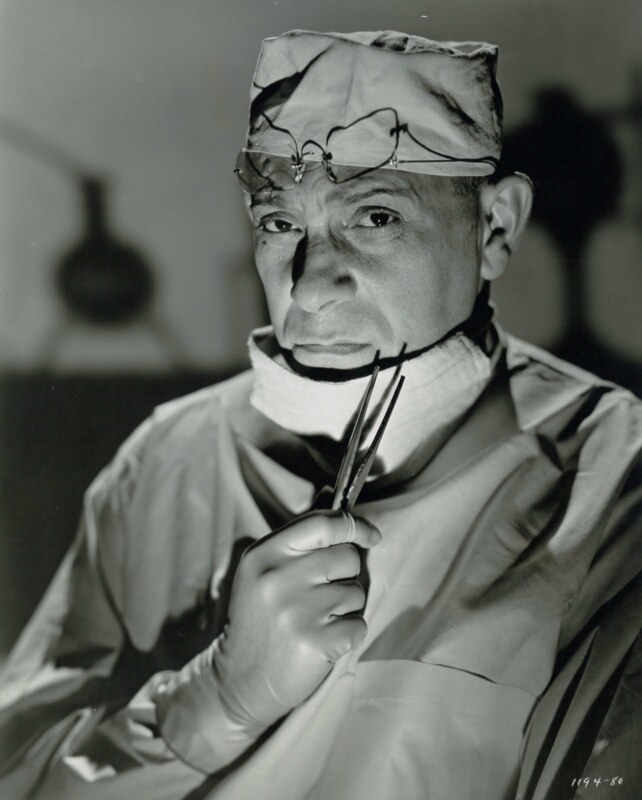 By far a best reason for watching today (or then) is down-on-luck Erich von Stroheim, slumming nobly (and he knew it) in service of cockeyed experimentation with a rifled brain. Stroheim in a mad lab is heaven itself for we who love him. That he's photographed here by masterful John Alton of later noir fame is just more icing. I'd like knowing why EvS didn't become one of the great horror stars after his directorial career went belly-up. Was ink of studio blacklisting too fresh? 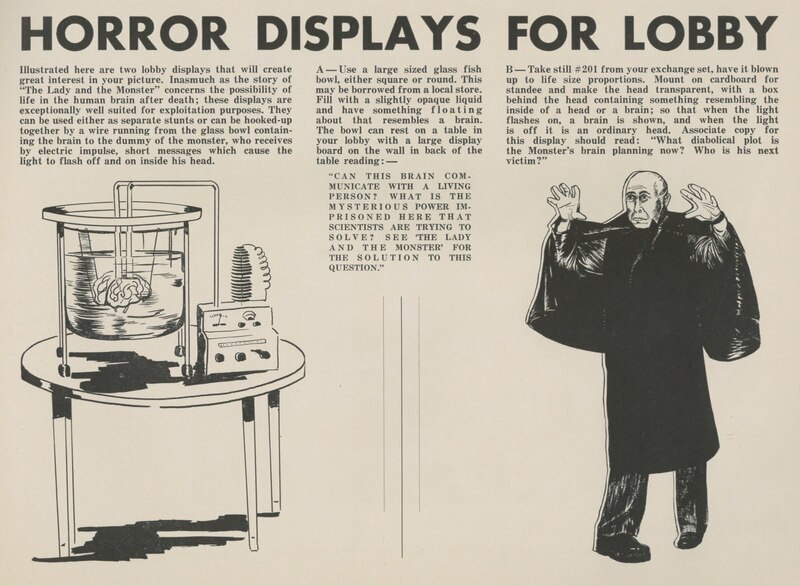 There had been a Crime Of Dr. Crespi in 1935 to point ways, but latter was risibly cheap and not enough by itself to put Stroheim in a Karloff/Lugosi race. Would EvS have shunned horror placement? Not for enough cash he wouldn't, anymore than other thesps who liked eating. If dignity were at issue, could Stroheim bear touring in Karloff's Arsenic and Old Lace part? Arthur Lenig's definitive bio points out that he did and gruelingly so ... that gig amounted to survival money for not only EvS, but also-traveling Bela Lugosi in the same role. Stroheim is so good in The Lady and The Monster as to make us regret he didn't go whole hog on chilla-menacing. Posterity would sure have been richer for it. And now for selling concerns: The Lady and The Monster got better bookings than customary for Republic thanks to extra effort and good will accruing for bottom-half hours efficiently filled. Chicago's Woods Theatre hosted its "World Premiere" in March 1944 (ad here), not with searchlights perhaps, but to a sparkling (said Variety) $15,000 for a first week, followed by a smooth $12K in the second. The Woods was the Windy City's 1,200 seat host to most first-run horrors and barometer as to how they'd gross nationwide. 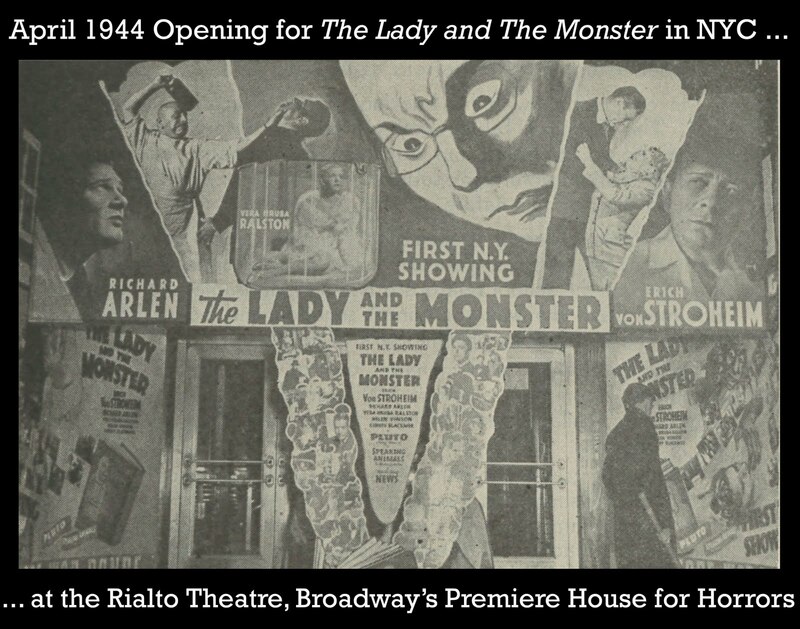 This venue and New York's Rialto served as bellwethers for The Lady and The Monster, the Rialto being the Woods' Broadway equivalent for measuring a monster's appeal. A $13,000 first (April) week at the Rialto was declared immense for this little seater (594), to which was added $16,200 over remaining two weeks of the engagement. All this seems chump change in modern parlance of multi-million $ opening weekends, but for 1944, such was meaningful return on modest outlay and reason why so many chillers came off assemblies. Worth mentioning is competitor Weird Woman from Universal, it having played the Rialto earlier in April, but staying just a week ... Not doing well at $8,000 and won't hold being Variety's verdict. Maybe The Lady and The Monster had juice Weird Woman lacked. Comparison today might tally about the same, at least in entertainment terms, difference being Weird Woman's around and accessible, while The Lady and The Monster, at least till Netflix's retrieval, was a tough nut to locate outside of grey-market DVD. It's well worth going in search for. Interestingly, the poster imagery often made its way into spook show snipes well into the '60s and '70s, usually accompanied by tracked (stolen?) music from Herrmann's score to DAY THE EARTH STILL! I have had a Spanish dubbed version for a quite a while. I tried to see it but I can't stand the dubbing from Spain (Mexican dubbings, in "neutral" Spanish are more tolerable, even if hate these versions). John Alton is great, but I prefer the films he made in Argentina which nobody reading this have ever seen (MADRESELVA, however, can be downloaded for free). 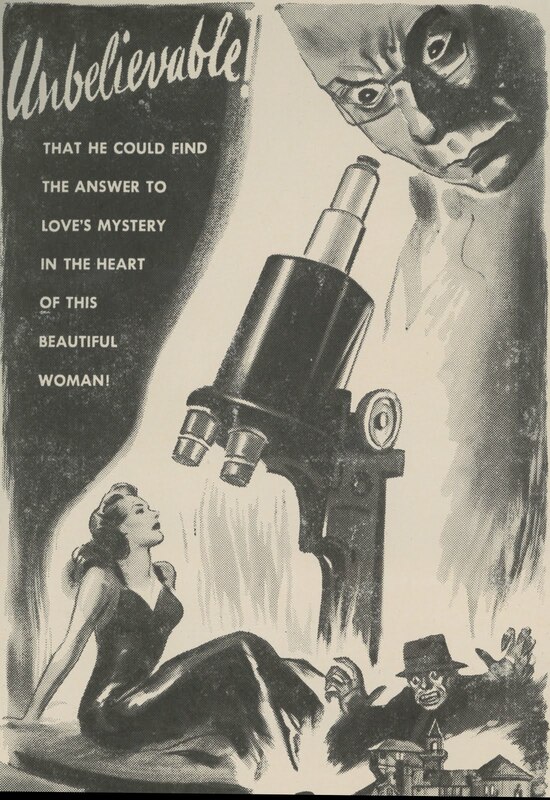 You've whetted my already sharp and longstanding appetite to see this first version of Donovan's Brain, remembering as I do (and fondly)the Lew Ayres remake on TV back in the '60s. But I think I'll pass on the Netflix option for now; I can't (yet) stream to my TV, and movies on a computer monitor aren't my cup of tea. What luck, then, that Cinevent in Columbus will be screening it -- and Memorial Day is just around the corner. I recently caught this on Netflix too. I was amazed at how homely Vera Hruba Ralston was. Was she Yates' mistress? Despite there being a lot to complain about in this movie, I'm a fan... in fact, I would argue for its "required viewing" inclusion in the classic horror movie syllabus, if only for its setting the stage for endless variations on the disembodied brain subgenre. I also think that it's an off-beat blend of horror, sci-fi, and film noir, probably because Republic didn't know what the hell it wanted to do with it (even the title is a bit tangential to the story). The multiple overheated and overlapping romantic triangles in this picture (and I'm including a triangle that involves Janice being jealous of Cory's love for Mueller's bizarre experiments) just adds to the weirdness of it all. November 27-28, 1944 - STATE Theatre, Salisbury, N.C. I was expecting more bookings locally since it could be bought cheap, but no others. 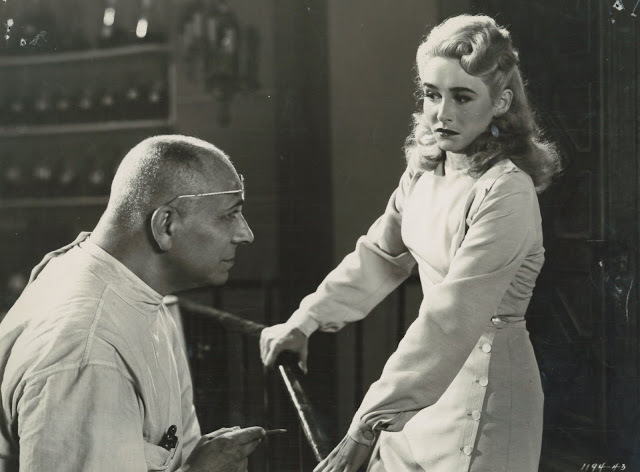 I think the reason Von Stroheim didn't stick around in B pictures in Hollywood was that he was an A star, or at least a top-billed character actor, in Europe. Besides the obvious Grand Illusion, he worked with top directors such as Fedor Ozep, Christian-Jaque, Pierre Chenal, Robert Siodmak and Raymond Bernard. He only came back to the US during the war, and as soon as it was over, did nearly all of his remaining work, with one obvious exception, in France. 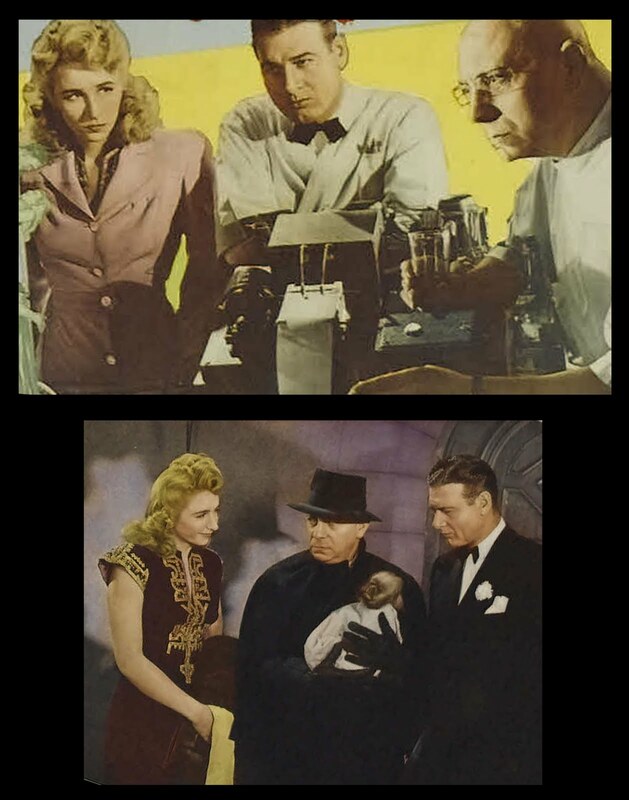 The poster with the image of Von Stroheim looking down menacingly at the microscope reminds me of the similar image in Paramount's "Dr. Cyclops" poster. Wonder if Republic was trying to get the draw the same audience in. I've heard the radio version of "Donovan's Brain," starring Orson Welles, and it's pretty spooky. For anyone who like myself is a Von Stroheim "addict", I beseech them (and you, John, of course), to seek-out an almost forgotten little film, post "Grand Illusion" -- 1940, called "I Was An Adventuress", an "A" pic, personally produced by Zanuck in which Stroheim and Peter Lorre,in a match only made in some kind of cinema heaven, play a pair of jewel thieves on the continent, as a kind of sophisticated,slightly more intelligent Laurel and Hardy! Von clearly had some input in some of the writing and directing, and the rewards to be garnered are, I need not add, well worth it! Stu once told me a very funny story about Ralston, who was indeed Yates' mistress: Every afternoon, when she was working, he would come down to the set and ask her one question:"Did you have a movement today?"